The international Symposium “Domestic Law in a Global Upswing? The Strained Relationship between International and Domestic Law” was held on 30-31 May 2016 in Berlin. One of its major elements was the Expert Conference “Four Decades and the Future of the Helsinki Movement”, conducted on the occasion of the anniversary of the Moscow Helsinki Group. Both formats gathered more than 90 representatives of NGOs, academics, legal practitioners, and renowned human rights activists from 23 countries. As Anna Sevortian, managing director of the EU-Russia Civil Society Forum, pointed out in her keynote speech, the purpose of the Symposium was to create space for networking potential joined initiatives and to discuss how to create and activate a common legal framework and make it work better for the just society. 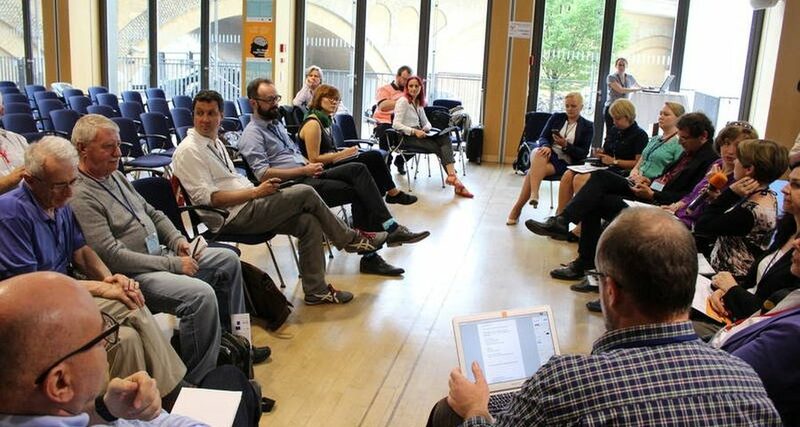 Participants discussed the challenges faced by civil society both in Russia and in European countries: the rise of nationalism and populism, declining prestige of international institutions, and authoritarian tendencies. Political powers that view international law and organisations as a threat to national sovereignty strive for power and take control in different countries. Many speakers mentioned the fundamental change in attitude towards human rights work in recent years, especially in Central and Eastern Europe. After the fall of the communist regimes human rights were a very popular issue with the population and generally respected by governments. Now NGOs and civil society activists encounter great difficulties, and not only in Russia. Concerns about “foreign agents” labelling were voiced during most of the workshops and discussions. For instance, while discussing “Challenges and Oppurtunities in Application of the International Law for the Protection of Nature Reserves“, the Greenpeace Russia Lawyer Mikhail Kreindlin reported that the listing as a “foreign agent” threatened the very existence of small environmentalist groups. The chair of the Russian Citizen’s Assistance Committee Svetlana Gannushkina strongly opposed this position: “Legislation is something written on paper, but the rule of law is an axiom. If a theorem contradicts an axiom, than the theorem is wrong. I will give you an example of how we resisted a law that many haven’t even noticed. When the ‘foreign agents’ law was passed, we were obliged to go to this guillotine on our own. But nobody complied. Sure, the state later outplayed us. It gave the right to register us to the Ministry of Justice, but we did not do what they wanted us to do. I think it was a very important act of civil disobedience”. Among topics discussed at the Symposium were gender equality issues (grave problems still remain in many countries), prisoners’ rights, human rights work on occupied and war-ridden territories, the current refugee situation. and the promotion of civil society and democratic values. A fascinating project was presented by Harald Hahn, the founder of Legislative Theatre. The project seeks to encourage the participation of less-privileged and vulnerable groups such as poor, disabled or old people in civic activities. Both actors and the audience form “political parties” and discuss and vote on legislative moves on social issues, domestic violence or other issues that can have immediate impact on their lives. A central event of the Symposium was the Expert Conference of the Helsinki Movement . It was opened by Gernot Erler, the German government’s Coordinator for Intersocietal Cooperation with Russia, Central Asia and the Eastern Partnership Countries. He remembered the foundation of the Group 40 years ago, as11 Soviet citizens started to document the human rights situation in the Soviet Union after the country signed the Helsinki agreement, and stressed their crucial role for the European human rights movements. From the very day of its foundation the Moscow Helsinki Group inspired those people in Eastern Bloc countries who chose to fight for democracy and the rule of law. They were followed by activist in Western Europe who put pressure on their democratic government to push for human rights and civil liberties in relations with the USSR and its satellites. Ludmila Alexeeva, a founding member of the Moscow Helsinki Group, described international solidarity as vital for the human rights movement. There are many ways in which international support for human rights can be practised. They include binding ties and building networks, but they also go far beyond. The example of the Moscow Helsinki Group demonstrates that actions in support of human rights in a single country can have a huge impact in the world where all countries are connected by treaties, agreements, and participation in various organisations. Mateja Steinbrück-Platise, a researcher at the Max Plank Institute for Comparative Public Law and International Law, visualised it by explaining how taking legal action in civil rights cases and demanding for more democracy on the domestic level influences international legislation and also affects the standards in other countries. The EU-Russia Civil Society Forum is looking forward to providing its platforms for further discussion of related topics in the future.